LETTER: Easier Route for McDonnells | Letters | Style Weekly - Richmond, VA local news, arts, and events. Ex-Gov. Bob McDonnell's biggest lapse of judgment was not in getting overextended in real estate or credit card debt, nor in accepting gifts from Jonnie R. Williams Sr., but in not accepting the plea deal that the feds offered last winter. 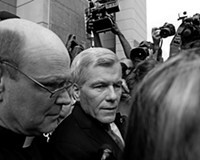 That deal (one felony count for falsifying a loan application) not only would have spared the McDonnells an exhausting, humiliating, expensive and ultimately unsuccessful trial, but would have saved his state pension and other benefits, which he now must forfeit since the guilty verdict involves official state conduct. What are the chances that the appeals court will wholly overturn the verdict? Probably slim to none, given the number of counts that the McDonnells were convicted of. He may never again run for political office, but former Gov. Bob McDonnell has to make a living somehow. So what happens now?